Echo Parakeet Wallpaper is an excellent high quality photo wallpaper of greenish bird Echo Parakeet or Psittacula eques echo. Echo Parakeet Wallpaper is featured in Wikipedia, it is taken by colhou in Flicker. This work is licensed under a Creative Commons Generic 2.0 License. Echo parakeet (Psittacula eques echo), the rarest Parrokeet in the world, saved from extinction by captive breeding programme at the Durrell trust Blackwater Gorge. The Mauritius Parakeet, also known as Echo Parakeet. Its local name is katover. 2,558 Ã— 1,811 pixels ; resize as needed. This Article Has Been Shared 1100 Times! Train Station Wallpaper is an excellent quality high resolution photo Wallpaper of Newark Penn Station taken with Lensbaby Composer. Summer Landscape Wallpaper is a beautiful HDR Photo wallpaper along with specific logo for Mac,Windows,Ubuntu. 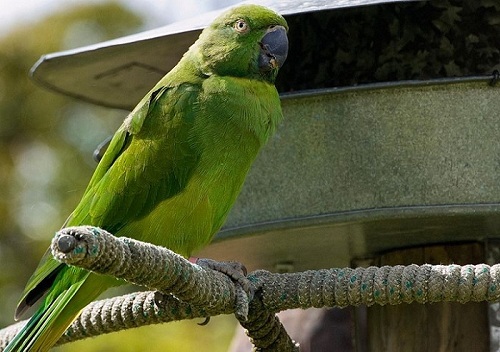 Cite this article as: Abhishek Ghosh, "Echo Parakeet Wallpaper for your Windows PC and Apple Mac," in The Customize Windows, August 10, 2011, April 24, 2019, https://thecustomizewindows.com/2011/08/echo-parakeet-wallpaper-for-your-windows-pc-and-apple-mac/.